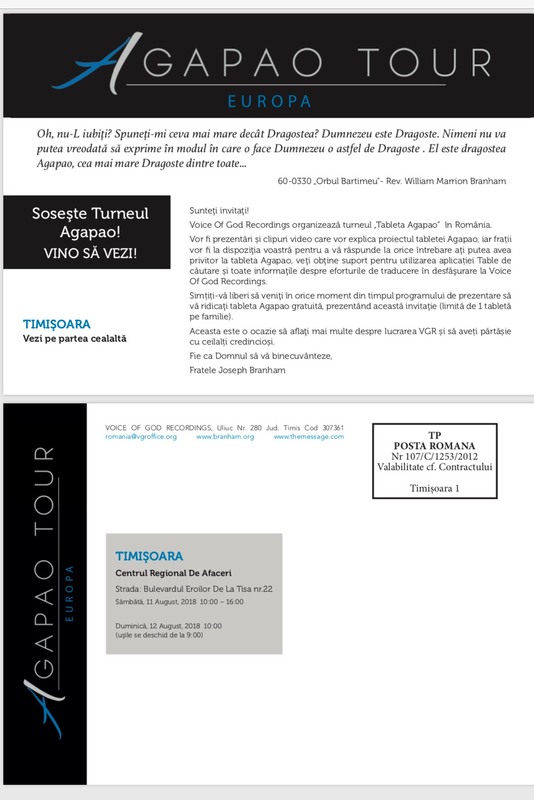 The Agapao Tour is coming! Oh, don’t you love Him? Tell me something greater than Love? God is Love. No one will ever be able to express how God is such Love. He is Agapao Love, the greatest Love of all. Voice Of God Recordings will be holding an Agapao Tablet Tour at the locations listed. There will be displays and videos explaining the Agapao tablet project, and brothers will be on hand to answer any questions you may have about the Agapao tablet, the Table search app, and Voice Of God Recordings ongoing translation efforts. Feel free to stop in anytime during the exhibit hours, see what VGR is doing, and fellowship with fellow believers. Saturday, July 7, 2018 10:00 – 16:00 in the "Weiße Halle"